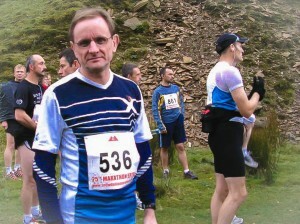 SDN are delighted to announce one of our members Vic Davies is putting on his running shoes to raise funds for us. At a recent fund-raising sub group meeting it was suggested we get someone to run a marathon for us. It was agreed that we ask for volunteers via Social Media site twitter & our account @shropdisnetwork. We tweeted on Shropshire Hour which happens on a Wednesday evening between8 pm&9 pm.This is a special hour whenShropshirebusinesses tweet asking/offering help. For those unfamiliar with twitter a # (hash tag) attached to a word highlights that word and by doing so statistics will show what is trending on twitter. It enables those following a particular debate, news item or particular interest to be alerted to other similar tweets. Within the hour a gentleman called Vic responded, we were even more pleased when we realised it was one of our own members. Vic has kindly offered to run not only the Lake Vyrnwy Half Marathon on the afternoon of Sunday 15th September but also the Shrewsbury Marathon on Sunday 23rd June 2013! So what do we know about Vic, well he lives in the Church Stretton area ofShropshire. He is a family man and has visual impairment. Vic joined SDN last year and since January this year, behind the scenes he has been involved in some admin work for SDN. The Board of SDN are so grateful to Vic for his kind offer that we are asking you to put both these dates in your diary. It would be great if you would support Vic, as he runs for SDN, raising money and promoting our organisation at the same time. We hope you will all get behind Vic and support his efforts. You can donate up to £10 in one text message, you pay the donation but the text message is FREE. If you are aUKtax payer you will also get the opportunity to Gift Aid your donation at no extra charge to you. ways you can help Vic and make donations in support of what he is doing for the work of Shropshire Disability Network. This entry was posted in Blog, Events, Fundraising Events, News on April 16, 2013 by Clear.